Thanks to all who entered our Love, Vera Pinterest contest! We had such fun looking at each and every board submitted, all of which were equal parts delightful and inspiring. We’ve included just a handful of our favorites below — take a peek and then scroll down for our randomly chosen winners. Shirley Huang and Christine Antoine, who both went for gold-hued invitations. Marnay Harris & Kelsey Wilburn, who both used our Aquamarine invitation as inspiration. Natalie Briggs. 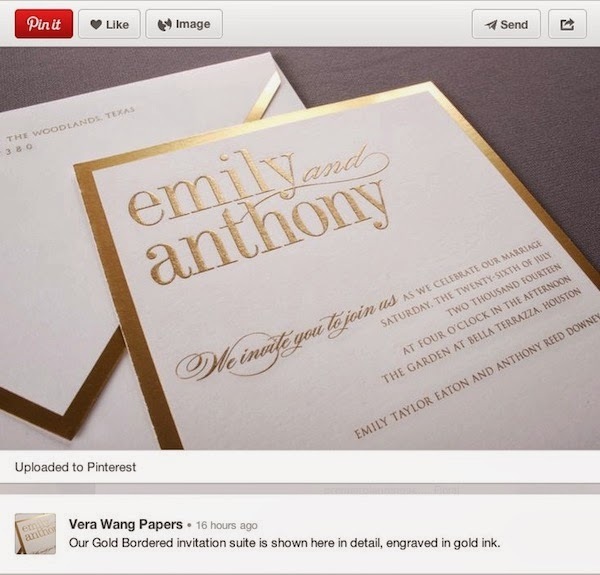 who incorporated our Letterpress Hearts invitation into her board. Congratulations, and thank you to all of our contestants for participating. We hope you enjoyed creating your boards as much as we enjoyed looking at them.